Just days after it was officially outed at CES 2011, the first pre-order pages for the upcoming Motorola XOOM tablet have arrived with the Android 3.0 touting device pegged with a whopping £720 price tag. Having initially appeared on the HandTec.co.uk website priced £659.99, the first device to be announced with Google's tablet-friendly Android Honeycomb OS saw its already over inflated price further increased to the hefty £719.99 mark. Set to come equipped with an Nvidia Tegra 2 dual-core processor, 10.1-inch 1280 x 800p display capable of handling 16:9 cinema-spec video content, a 2-megapixel front-facing camera alongside a 720p HD video recording capable 5-megapixel snapper on the rear, the XOOM will attempt to challenge Apple's market leading iPad atop of the tablet tables when released later in the year. Featuring 32GB of in-built storage alongside, 3G and Wi-Fi connectivity capabilities the XOOM, if HanTec's £720 pricing is an accurate portrayal of final pricing, will come in over £100 more expensive than a similarly specced iPad with entry model prices for the Apple tablet kicking off for as little as £439. Offered up alongside the Xoom, HandTec are presenting a range of pre-orderable Motorola tablet accessories with a speaker dock, portfolio case and wireless keyboard already available. A definitive official UK release date and pricing for the XOOM has yet to be announced by Motorola. Can the XOOM be a true iPad beater? 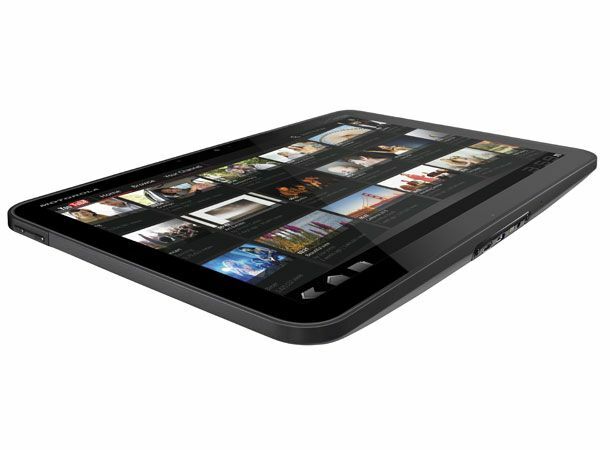 Let us know what you think of Motorola's first foray into the tablet market via the T3 Twitter and Facebook feeds.